Within less than a year, an innovative facility will be preparing area citizens for careers in high-tech industries. 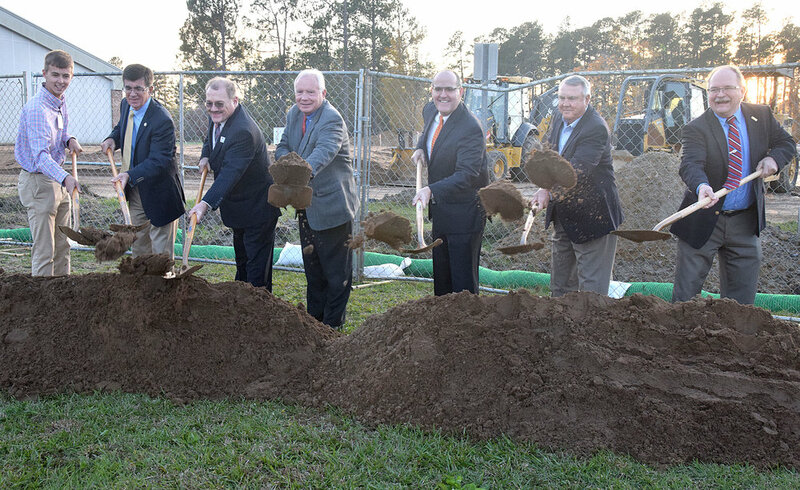 Southeastern Community College representatives turned the first official shovelfuls of dirt Monday for a new Advanced Manufacturing Training Center. Student Government Association President Tanner Bullard, Foundation President Terry Mann, Vice President of Administrative Services Daniel Figler, Board Chair Henry Edmund, President Anthony Clarke and board members Robert Ezzell and Gary Lanier heave the fi rst offi cial shovelfuls of dirt at SCC Monday. The board consulted with area employers, including Council Tool Co., Honeycutt Produce and Atlantic Printing, to find out what current and future employers need in their workforce. Highly trained workers need to be available before new manufacturers will want to settle in Columbus County, Edmund said. Renderings on display showed a sleek stone-and glass entrance melding onto the one-story brick building. By introducing “a whole new design,” Edmund said the addition will “bring new curbside appeal to the campus.” The project will add about 7,500 square feet to the north side of the existing T Building, near the front entrance to the campus. Earth moving equipment has been in action much of the fall semester, preparing the site. The project is funded by the college’s $6.8 million share of the Connect N.C. Bond voters approved in March 2016. “We began working with Boomerang Architects to plan the construction in the summer of 2016,” said the college’s president, Anthony Clarke. Clarke hoped construction could be completed next summer, in time for the beginning of the 2019- 2020 year. Clarke and Vice President of Academic Affairs Michael Ayers detailed some of the technologies that will be taught at the training center, which will include hydraulics, pneumatics, computer numerically controlled (CNC) machining and mechatronics. Clarke and Ayers explained that CNC machining is a method for creating products by translating the design into a numerical model. Mechatronics combines electrical and mechanical engineering with electronics. The building will provide a large open work floor that will be able to mimic many different industrial processes that students will find in the work world after their training. The building will include two classrooms for teaching computer-aided drafting and other computer skills. Industries want workers who can “not only run machines but maintain them as well,” Clarke said. He anticipates that the training center will serve degree-seeking students, certificate-earning students and current industrial workers who need continuing education. SCC’s M and B buildings will also receive improvements using the Connect N.C. bond money. Board chair Edmund thanked SCC’s facilities committee for their work to bring the project to the groundbreaking stage, and he recognized SCC Foundation officers present for the ceremony. Terry Mann, foundation president and mayor of Whiteville, said he believes the new facility will be “tremendous, not only for the college but for the community” and will possibly help attract businesses to the area. 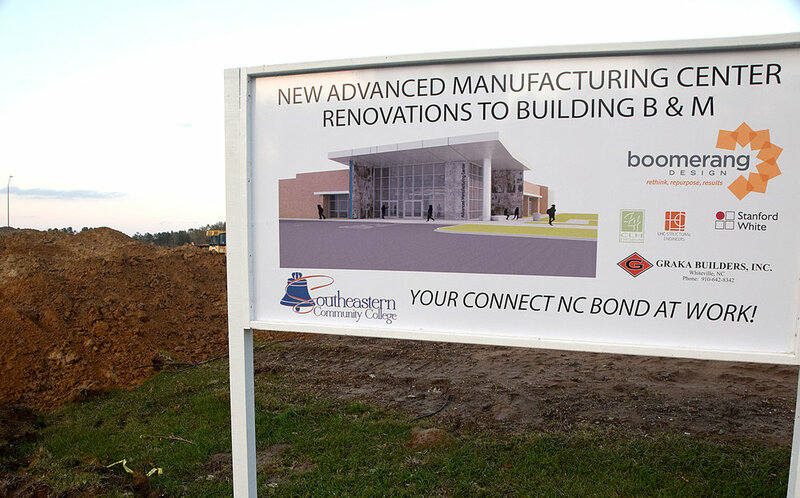 A sign by the site features a rendering of the Advanced Manufacturing Center under construction at SCC.